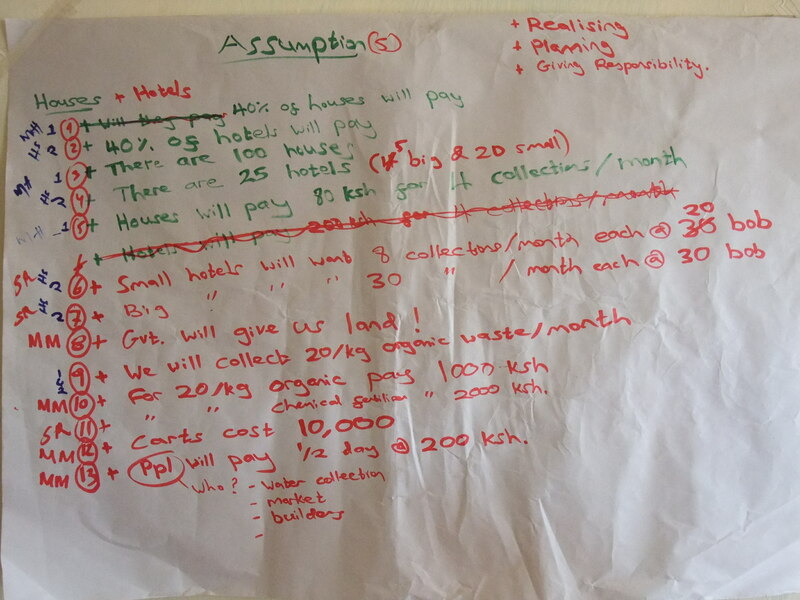 One of my favourite lessons so far was in Salgaa where Sparks Youth Group are developing the idea of a garbage collection and recycling business. The lesson certainly didn’t start well as most of the group turned up 30 minutes late. But over the next hour something very nice happened. For 2 weeks we asked this group to go out and do market research with potential customers. Sadly only 1 person did any research. His results from testing were partly positive – it appeared there was some appetite among the people of Salgaa for a refuse collection programme. Currently all of the rubbish gets dumped on the streets. But with only one person committed to the idea nothing can happen. Refusing to give up we asked the group to write all their assumptions for the business. We did this because we understand that inside the building everything is just guess work. It is paramount to firstly realise these guesses and then get out and test these guesses with potential customers. Only then can we know whether we have a viable business idea. For this idea there are so many uncertainties to be tested. So many assumptions. How much will people pay? How many houses will pay to have their rubbish collected? Will hotels pay for a rubbish collection? If so how many times a week? How much will a cart cost to collect the rubbish? Will we be able to sell the organic waste to farmers as manure? If so for how much? How much organic waste can the group collect each week? We wrote these assumptions up on a big piece of paper and after 30 minutes we had 14 assumptions to test. Then the most important bit happened. The group discussed among themselves who would do each task and they wrote their initials next to the assumption they would test. This was unplanned but it just came naturally. Previously we have missed this stage but it is absolutely crucial. By giving each person in the group a specific responsibility there is accountability. If they don’t test their assigned assumption then the business cannot start and they will let down all the other members. Crucially, this responsibility was delegated to each group member by the group, we took no lead in this. We just stood back and listened. So we left with the message ringing strongly in their ears – ONE FAILS, ALL FAIL. We’re not sure if this will work but we really hope it does because they could start a fantastic business.